My Friend Huggles was borne from a mother’s love for her children and the need for a tool to help teach her children to adopt a centered moral compass. The My Friend Huggles core philosophy and commitment is aimed at nourishing and enriching the well-being of children through a combination of meaningful play and self-awareness. Children will delight in the innocence of these adorable, life-size dolls, sure to become one of their first companions. Each doll has a different character-building value associated to it as explained on a satin ribbon found on the doll’s back. With every doll is the opportunity to experience the vision of its founders. We offer a unique experience, as children will be inspired to learn key values and are encouraged to demonstrate this in their daily life. Our interactive website supports value adoption and with each value learned, the child will be given an award certificate. Our website encourages each child to share their experiences with others so that they may inspire social awareness and change. 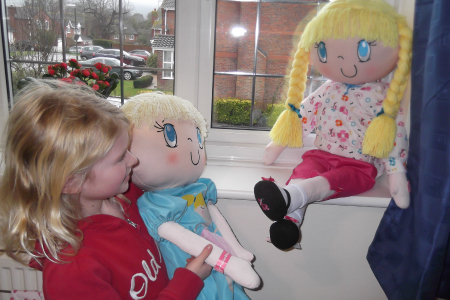 To build this community, we have built this blog to share information and allow children the opportunity to share their experiences; read about other inspiring real life stories that will serve as shining examples, encouraging them to exude confidence and live the values as real life Huggles, just like our dolls!